Welcome to Nyraju Skin Care, The First Natural Skin and Hair Care Company Founded by An Esthetician for People of Color! Thank you so much for stopping by to visit. You're here because you'd like to know who we are and what we do. But more importantly you want to know if what we do will provide a solution to your skin and hair care challenges. We are the First company to come to market with a Natural Skin Care line for African Americans. We've always been a natural/organic based company and as an Esthetician or Skin Therapist as we're referred to these days, I understand your skin and a lot of your challenges. 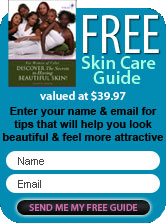 The products on our site have been created and formulated for skin challenges that you and I have faced over the years. When we started our company, from the very beginning, we've Always been a company that believed in natural and organic ingredients for your skin and hair. No hydroquinone, no lead or heavy alcohol. That's right, as an Esthetician, I developed and formulated this line of skin care products specifically for you, the African American woman or Woman of color. As a result of dealing with the stress and illness of my parents, my skin and hair took the brunt of the stress. My temple hair disappeared and left me with fuzz. My skin was dull and ashy primarily because I was too tired to get or give myself treatments when I returned home. One night I found myself in the tub with no water and I knew I'd hit a wall. I promised myself that I'd take care of me from that point on. With the use of essential oils, aromatherapy and nutrition, my skin began to look better and my hair began to grow. My concoctions became the talk amongst friends and family, so everyone got samples and became test subjects. When they wanted to pay me money, I knew I was on to something. This was the foundation of what is now Nyraju Natural Skin Care. And of course I would only start a business that provides you with natural and organic products. I knew that I needed a lot more information so I decided to go to school and begin my journey of learning all about the skin, Melanated skin in particular. I became an esthetician and studied every piece of information I could find that enables me to help you with your skin and hair. It allows me to assist you with your skin and hair care needs from a holistic point of view. Your skin is the largest organ of your body and you have more melanin than other people on the planet. Melanin makes you a very special person. Your bronzed and beautiful skin makes it a gift and challenge to you. When you approach skin care holistically you treat your skin and hair from the inside and the outside. Dark spots, Uneven Skin Tones and Hyperpigmentation are part of the challenges you face with your beautiful black skin. Dry, brittle and sun damaged hair are also part of your daily challenges. But natural products with quality ingredients and great eating habits will win out every time. Natural Products with Quality Ingredients? ... Yes, Natural Products with Quality Ingredients. Green teas, Shea butters, mango butters, cocoa butters, hyaluronic acids, essential oils, olive oil and lots more, all to make your skin feel soft as a baby's bottom. We're a family owned business. My husband, daughter and son are at the helm with me and we have a great support staff to pick up the slack and make sure things run smoothly. We strive to provide you with Great Customer Service. Call me if you have a question and if we're out of the office working a trade show or processing orders for you, Shoot me an email and I'll get back to you within 24 hours. Thank you for spending a few minutes learning a little about who we are. Browse our online store and check our our "Articles" category for more information and see what we have to offer.